If saving space in your home is a priority then the ProGear 225 foldable upright bike will fit your exercise needs. An important part of your workout is knowing your heart rate throughout your workout to make sure you are maximizing your calorie and fat burn, so we also included a heart pulse monitor. In addition, we upgraded the crank system to provide a smooth and consistent pedaling motion. Transportation wheels allow you to move the ProGear 225 to different room locations or if possible even in a closet. So start getting fit and healthy with the ProGear 225 foldable upright bike and get the workout you have always wanted. Features: 220 lbs. Weight capacity. Compact design perfect for limited spaces or small apartments. An 8 level magnetic tension control system for an easier or more challenging workout. An easy to read computer LCD display that indicates calories burned, distance, time, speed, pulse and scan. Heart pulse sensors allow you to monitor your heart rate. Dual transmission flywheel allows for higher resistance workout. 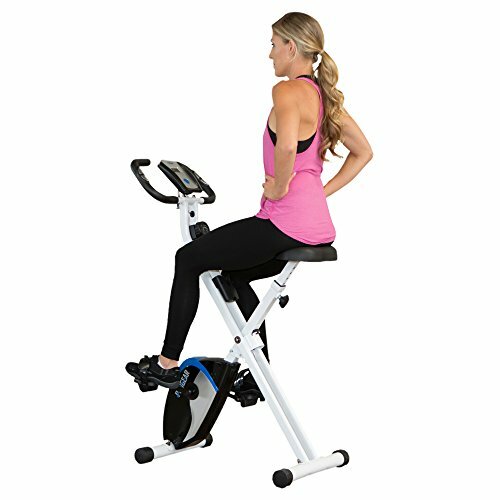 3 piece cranking system with magnetic tension provides a smooth and consistent pedaling motion. Ergonomic contoured seat cushion easily adjustable to fit 5'1" to 6' user heights. Larger pedal design with safety strap prevents any foot slippage when exercising. The precision balanced flywheel and V- belt drive provide a smooth and quiet operation and will not interfere with watching TV or listening to music. Folds to almost 1/2 the size, so it is uniquely compact. Folded dimensions: 19" L x 17.5" W x 53" h. Adjustable leg stabilizers to prevent any movement or tipping when exercising. Transportation wheels included for easy relocation. Accessory holder included. All batteries included (2 AAA). some Assembly required. 1 year limited warranty. Product setup dimensions: 32" L x 17.5" W x 46" h. Product weight: 34.8 lbs.